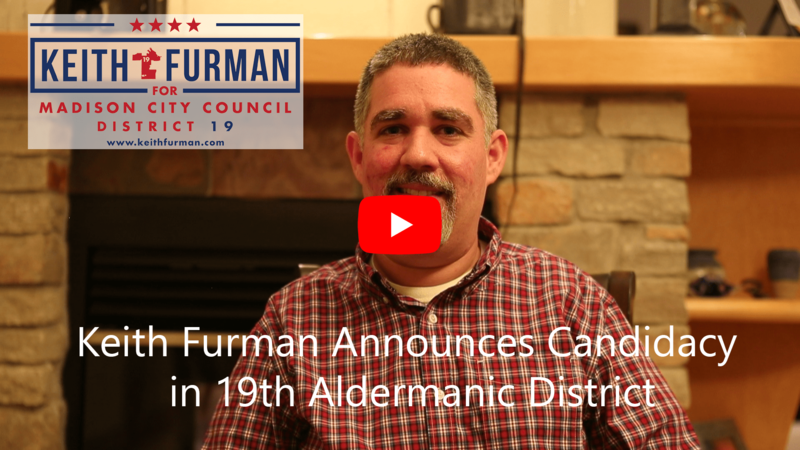 ​MADISON, WI – Keith Furman today announced he will run for election in Spring 2019 to represent District 19 on the Madison Common Council. Furman was appointed in August to the seat previously held by Mark Clear. If elected for a full term, Furman will continue ensuring residents’ voices are heard through extensive outreach. He will focus on strategies to protect against the impact of flooding, strengthen our transportation infrastructure and ensure that Madison is fair and equitable for all residents. “Since taking office in August, numerous residents have stopped in during my open office hours or emailed me about challenges and opportunities in our neighborhood. It’s been rewarding to help resolve individual issues with city government and to begin addressing broader concerns by co-sponsoring measures the whole council has adopted. In a full term, I plan to continue focusing on outreach with neighbors and neighborhood associations to understand their concerns and keep them updated on the issues. Furman said he also intends to focus on addressing economic and racial inequity in Madison and believes that Madison needs to be a safe and fair place for all residents. Furman and his wife Sandi, a Wisconsin native, have lived in Madison for more than five and a half years in the Spring Harbor Neighborhood. He is a technology professional who most recently served as chief technology and chief strategy officer for a health care technology company. After helping the company grow from a start-up to a thriving company, Furman sold his ownership stake and left the company to focus more directly on serving his community. Prior to moving to Madison in 2013, the Furmans lived in Hoboken, NJ, where he served as chairman of the Hoboken Planning Board. In that position, he helped facilitate the implementation of many sound city planning initiatives, including a reexamination of Hoboken’s master plan for Zoning and Development.